The Australian Crime Writers Association (ACWA) has announced the winners for this year’s Ned Kelly Awards for Australian crime writing. 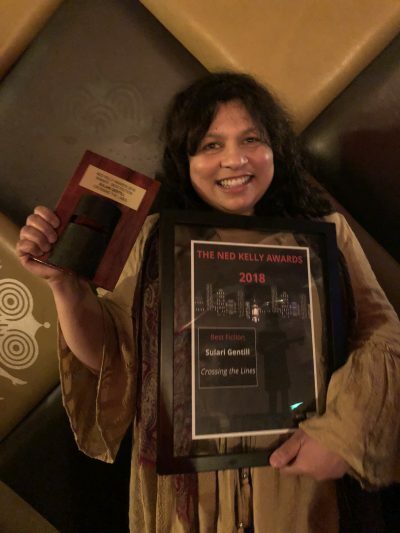 The Best Crime Novel was presented to Sulari Gentill for her novel Crossing the Lines (Pantera), a meta-narrative involving two crime authors who write each other’s story. The judges described it as ‘an intricate dance of mystery and psychological suspense that blurs the lines between real and fictional, sanity and insanity, obsession and love’. The Best First Crime Novel went to Sarah Bailey for her novel The Dark Lake (A&U), a police procedural that the judges described as ‘a sophisticated first novel with a strong emphasis on character and setting’. The Best True Crime award went to investigative reporter and producer Graham Archer for Unmaking a Murder: The Mysterious Death of Anna-Jane Cheney (Ebury), which examines the murder of Anna-Jane Cheney and the subsequent imprisonment of her fiancee Henry Keogh. The judges described the book as ‘a fascinating, detailed and well researched tale of a gross miscarriage of justice by a system more concerned with sustaining the status quo than pursuing justice’. Garry Disher was honoured with the Lifetime Achievement Award for his ‘outstanding contribution to Australian crime fiction, using his characters to explore and expose Australian culture’. Disher has published over 50 books, including the ‘Wyatt’ series and the ‘Peninsula Crime’ series, and has previously won the Ned Kelly award for best crime novel twice, for Chain of Evidence (Text) and Wyatt (Text). The winners were announced at an event at the Melbourne Writers Festival (MWF) on 26 August, where Booktopia CEO Tony Nash announced his company will sponsor the awards for the next three years. To see the shortlists, click here.